First there is tabletop lighting. Candles are the most romantic way to add some soft light to a wedding. 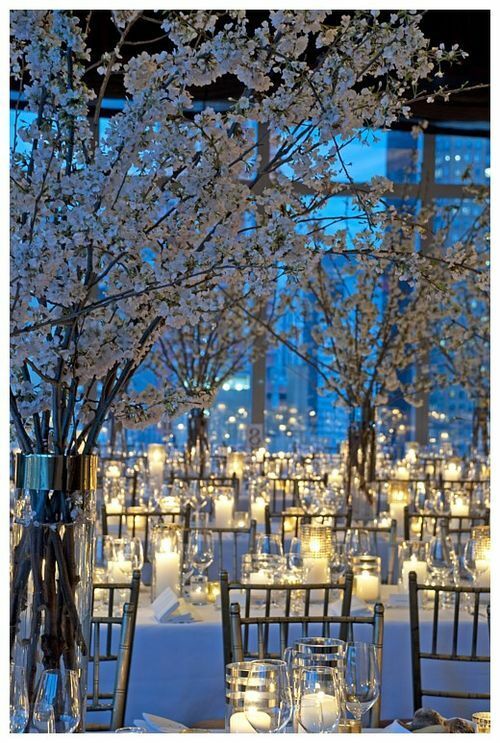 For an outdoor wedding, candles in glass will tend to work best, as they will be protected from the wind. 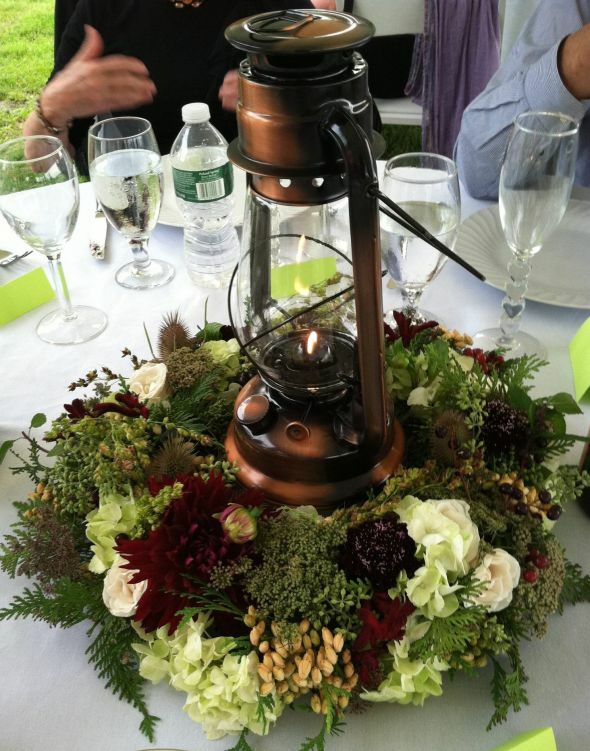 A simple hurricane lantern surrounded by a floral wreath is one lovely idea. Votives in beautiful holders are also great. Particularly interesting are pierced candleholders in colorful glass with a Moroccan flair. The flame will flicker and dance through the pierced design, while the colored glass will cast wonderful reflections on the tables. For an autumn wedding, a fun way to add light is through the use of carved pumpkins. They are a terrific seasonal detail, and will also add soft illumination to your reception. Carved pumpkins do not have to be traditional Halloween jack o' lanterns, if that is not your style. Almost anything can be carved in a pumpkin, including monograms, geometric motifs, and symbols like hearts or doves. 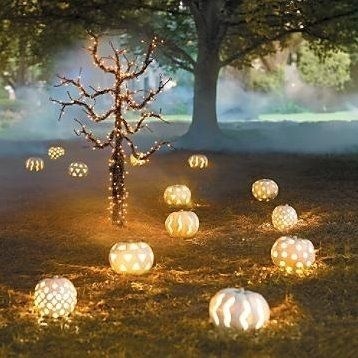 Masses of glowing pumpkins look especially dramatic when placed in a row, such as along the top of a stone wall lining a driveway or behind the bar. 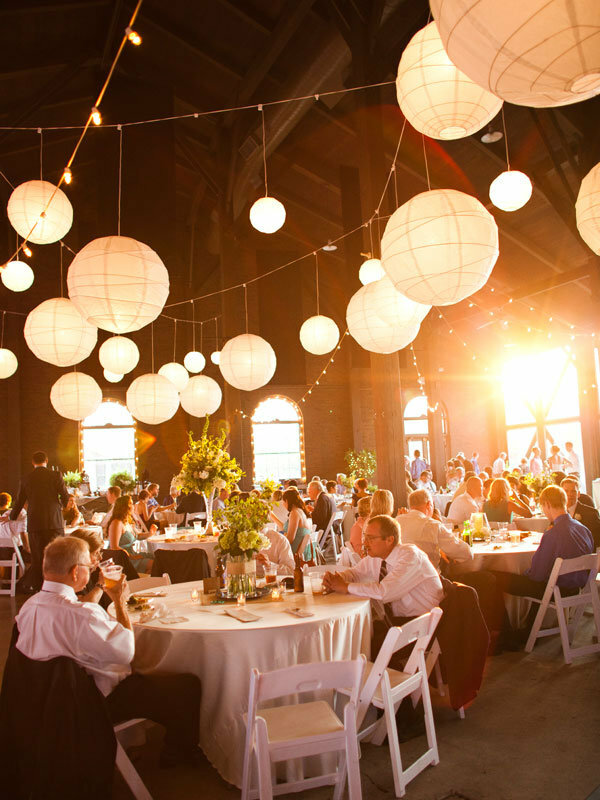 Twinkling white lights are another beautiful addition to an outdoor wedding lighting scheme. They can be wrapped around tree trunks and tent poles, scattered throughout tree leaves and foliage, and even intertwined directly into tall centerpieces. A gorgeous effect can be created by hanging numerous tiny white lights over the top of the reception area to mimic the effect of a starry night. If this is impractical to do for a very large area, consider doing it just over the dance floor. Your guests' fancy dresses and Swarovski crystal earrings will sparkle and shine as they dance the night away in the beautiful glow cast by hundreds of little white lights.